Join us for a paired children’s cooking class & garden tour at our Little River Cooperative nursery in Allapattah on Sunday January 28th. Bring your little ones to experience the local harvests with culinary instruction by The Cooking Collaborative. Kids will be led on a garden tour with Farmer Muriel, harvesting items such as radishes, beans, and edible flowers. They will continue the day with Chef Deanna of The Cooking Collaborative, utilizing ingredients they helped to harvest to create a light lunch. $40.00 / per child includes light lunch for parents (up to two parents per child and baby siblings welcome!) This class is open for kids between the ages of 4 and 13. All kids must be accompanied by at least one parent or guardian. The class includes a garden tour during which the children will harvest ingredients for the workshop as well as taste and smell many other veggies, herbs and edible flowers. The tour is followed by a trip to the washing station to clean veggies and wash hands before sitting down for instruction. Chef Deanna has prepared a hands-on kid friendly curriculum which includes drawing, cutting and chopping, mixing ingredients and helping the chef to complete the menu options. She's created a cute menu for the kids to prepare along with a delightful farm fresh meal for parents. Before going home each child will have a chance to decorate a terracotta pot and fill it with an herb or edible flower plant to take with them for future meal inspirations! Bunny’s Favorite Salad - Baby lettuce mix and rainbow carrots from French Farms, garden tomatoes, baby radishes and green beans harvested from our garden. Served with a vegan ranch dressing. Super food Oatmeal Cookies - Ooey gooey raw cookies with vanilla acai vegan chocolate. Lemongrass Lemonade - Little River Cooperative’s lemongrass combined with refined sugar-free citrus mix. Signing up is simple - Click the link below to purchase tickets on Little River Cooperative's website. Keep in mind it will be at our nursery which is quite primitive; that means it will take place outdoors surrounded by nature and our beautiful field full of produce. The nursery is located at 771 NW 24th Street in Allapattah just west of Wynwood. We'll send a reminder email with all of these details a few days before the event. Due to the size and nature of our workshops and special events they are non-refundable. If notice is given 48 hours in advance we can try and replace you (we often have waiting lists of people who may want your spot), however if no replacement is found a refund will not be given. If we have to cancel the event you will be refunded for 87.5% of what you paid (we keep 12.5% to cover processing fees). Thanks for understanding! 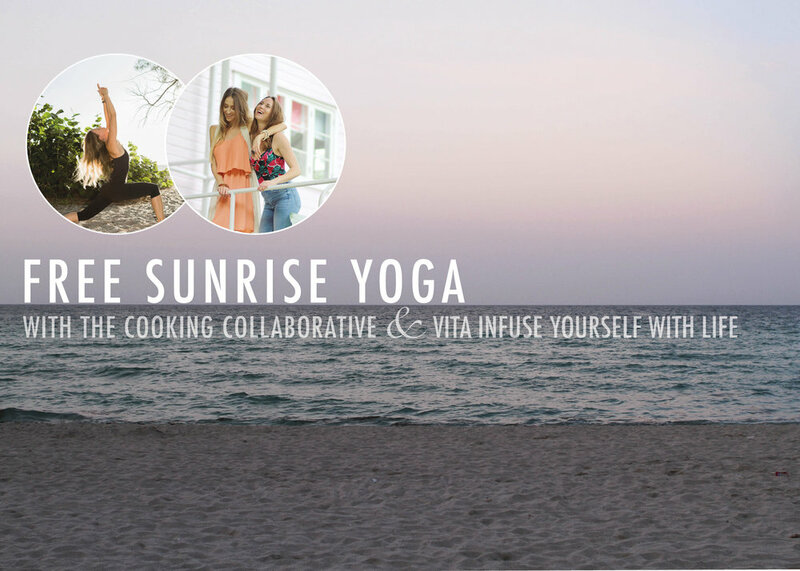 Join us for an awakening sunrise yoga session in beautiful Surfside Beach, directly south east of Bal Harbour Shops. The Cooking Collaborative will be showcasing our heavy push towards a more digital presence. During the closing session, will collect data to better serve our community as well as sharing our new detox and on-line culinary coaching options for digital clients. "Vita Infuse Yourself With Life promotes transformation and self-healing. Vita offers unique Intuitive Transformational One-On-One Coaching as well as Group Coaching Experience REVIVE! Regain your life with compassionate mindset and experience radical healing with yoga practice, mindful meditation, deep controlled breathing, and Reiki. Join Vita for many educational awareness-raising workshops, community events, and life-changing retreats." Please bring a mat or a towel, water bottle, and light jacket/sweater. There is parking along the street on Harding Avenue as well as behind CVS and Starbucks. Please remember to pay and walk along 96th street to enter the beach access. Turn right when arriving on the sand. We will be located a touch south of the entrance. VISIT US AT EXHIBITOR SPACE # 36! JOIN US & OUR FRIENDS AT ESSENCE NUTRITION THIS FEBRUARY! Can't pledge $100? No problem! We're still rewarding those who donate $50 with an organic Tarragon plant & other prizes! Once you're on our kickstarter page, select "Pledge $100 -FOODIE + YOGIE VIP STATUS" to gain access to our official launch party at Inhale Miami! Click the link below and select "back this project. Select "Pledge $100 or more FOODIE + YOGIE VIP STATUS" for your entry to our official launch party! NOT DOWN TO 'PARTY' BUT STILL WANT TO DONATE? We'll be in our hometown @ Easton Public Market on September, 17th from 9:00-11:30AM teaching a vegetarian cooking class inspired from around the globe & sourced entirely from the #610! We're stoked & cant wait to see you there! Get your tickets here as they will go quickly! Seats are limited to only ten guests. Macedonian/Serbian inspired roasted red pepper sauce dressed with a fried egg, feta, & fixin's. wweet potatoes dressed in a smokey tahini sauce, pinenuts & herbs. ARE YOU AN EASTON BUSINESS? LET'S COLLABORATE! @ MORTAR & PISTIL AT THE WYNWOOD YARD! "Farm-to-table food, rosé all day, scents of citrus in the air, daybeds with swings, fresh roasted coffee - welcome to the yummiest fresh and foraged brunch in Wynwood! Indulge your mind and learn skills such as lock-picking and pickling from the Tactivate team as you enjoy in a sumptuous Sunday brunch. This Sunday's delicious brunch is catered by Chef DeeBoss from The Cooking Collaborative with greens straight from the Wynwood Yard! " RESERVE YOUR SPOT AT THE TABLE!